Whether you’re a small business or an advisor working with one, it’s important to know which jobs deliver the best return on investment and which ones need to be reined in. 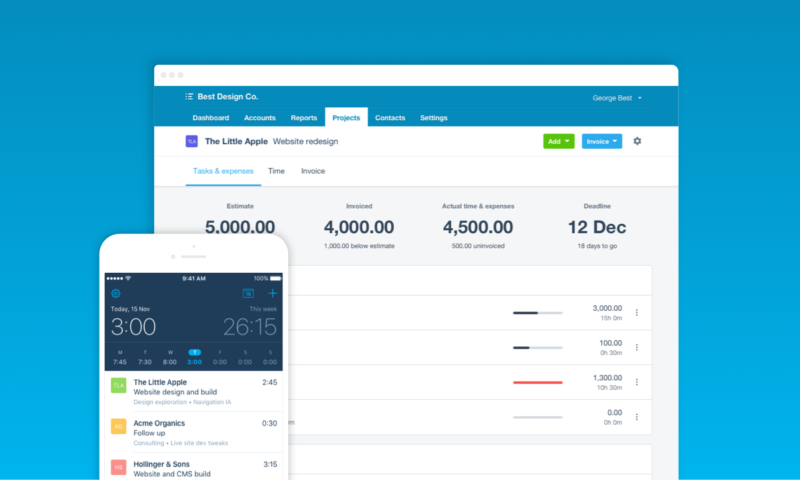 Cue Xero Projects: the simple way to capture, track and report on the time and money spent on each job so you can proactively invoice, make informed decisions and manage your project financials more efficiently – all with one Xero login. Profitability and time are the linchpin of service businesses and Projects was built with this in mind. It’s geared at businesses with straightforward time and job cost tracking needs and will really appeal to those still fiddling around in spreadsheets, or who find most project management software too complex. If your job costing and tracking needs are more complex, watch this space because we’re working on even more awesome functionality. Going forward, everyone from architects, engineers and tradies, larger accounting and legal firms and more can make use of this helpful tool. Xero Projects is a great tool for small accounting and bookkeeping businesses, and it’s open to all Xero Partners at no charge. You can explore Projects for your own practice using the Xero Practice Organisation – and be sure to invite your clients to try it, too. Simply pop into the explorer feature in Xero HQ to find clients most suited to Projects. Then flick them an invite directly from the Projects tab in their Xero organisation. If you’re the subscriber, you can enable projects for them right then and there. Not only is this a fantastic way to improve your client’s business, you’ll soon earn partner points for clients using Projects where you hold the subscription. If you’re a small business with simple costing needs, Projects is likely the perfect solution for you. Simply have your subscriber add Xero Projects to your subscription via MyXero. Unsure if Xero Projects is right for you? Reach out to your Xero bookkeeper or accountant and let them know you’re keen to learn more. They can help you decide if it’s a good fit, then activate Projects and you’re good to go. Small businesses and Partners can experience how Xero Projects works before adding it to their plan in the Xero demo company. This looks like a great option, can you provide some detail on the cross over with Xero owned Workflow Max, or will this replace it? Workflowmax is still a big part of our job management strategy. Essentially we see them servicing different parts of the market. Projects is best suited to small businesses and solo operators within professional service industries with simple job management needs such as design agencies and IT professionals. WorkflowMax is a full featured complete job management system. It has much richer customisation than Projects and is therefore better suited to those SMB’s running more complex businesses with large numbers of customers and staff. However, Xero is much easier to use, and the invoices are much prettier and easier to customise, Workflowmax won’t let you have more than one invoice template – we have two locations and require a Vic and NSW template. WFM won’t let you enter an ABN, it’s search function is absolutely terrible, and it won’t let you send expenses to your accounting software. The client data is pitiful – there’s no way to select multiple addresses for one client, there’s no way to set a specific accounts person for invoicing purposes. WFM won’t let you give invoices a unique name or number. – I’m considering moving to Xero Projects as I already use Xero and see that it would be much smoother. 3) Is there ability to have a ‘description’ for a task? Is it possible to set up a consultation with someone to go through some of these questions? I’ve answered your questions in order below. 1) We don’t have an integration with Asana, or any products like Asana. We do have a public API for Xero Projects though, so it is perfectly possible for integrations to be created by them. 2) We don’t have a project ‘template’ feature, but there is a feature to copy projects. You could set up a model project with the tasks and details you’d like as the template, and then make copies of it when you create a new project. This would save you some time when setting up a new project. 3) You can add a description to each individual time entry, which is logged against a task. But there’s no way to add a description to the task itself. As a Xero user this is beyond offensive and literally makes me despise Xero. So because we buy direct from Xero, we can’t get this functionality we desperately need. But if we purchase through an accountant, we can get it, if they consider us worthy. If I were to end this the way I’d like to, it would involve profanities. For this initial release projects is available to clients of all Xero advisors. This means if your accountant or bookkeeper is a Xero partner, simply contact them to have the feature activated. Alternatively you can complete the form at http://www.xero.com/projects and we can activate on your behalf. Towards the end of this year we will be making projects available directly to all organisations. Hope that helps. This enhancement will be a great addition for some of my clients, however I think Xero you need to keep an eye on your pricing, you are quickly becoming one of the more expensive in the market and hard to justify the cost. $10 per person per company? Why not charge $10 total, to stop companies having multiple users just regestering one account and sharing it. Great to hear you’ve got lots of clients projects will suit. We know it’ll be super useful for a range of small business and it should also help you work with your clients to see where they can trim their costs and focus their time. An introductory launch price (from January 2018) of NZ$7/per user per month will apply as we build out the product rising to the $10 price point thereafter. We have extensively researched the market and are confident this pricing offers huge value for our customers as we roll out more projects features and functionality into 2018 – keep an eye out for our product release updates to see how this is tracking. Just wondering which subscriptions Xero Projects is available for. I am an accountant and currently I have noticed that Xero projects is available for some clients but not all. Xero Projects is only available to Partners until full public release at the end of this year. Partners however can give access to their clients. This means if you have practice access to your client’s Xero organisation, you’ll be able to see the Projects tab in their org. If you are the subscriber, you can enable Projects for them right there and then. If you are not the subscriber, you can invite the subscriber to try Projects. This will send them an email and will make the Projects tab visible to the subscriber next time they log in. Remember for a user who is not the subscriber to see the Projects tab, they will need to have the Projects user permission set for them. I use xero now but FreeAgent has had this ability built in for ages within the standard price which is much lower than xero. While I completely welcome this addition as it looks great , I think it’s long overdue and I don’t think it should be an extra cost when it’s only really adding something that other packages have done for awhile for much less! Is there a limit to the number of projects that can be created? Also, for customers with multiple projects, is there functionality to report on both the individual project and the total projects for a particular customer (eg. a customer may have 5 sites and we want to see the project P&L for the individual site/s and consolidated view? thanks. No there is no limit on the number of projects that can be created. Within the current Project Summary report you can see a summary of your projects, either in progress, or all projects grouped by customer. This can give you an overall view of what is going on across all the projects for that customer. You can find out more about Projects reports here: https://help.xero.com/nz/ReportProjectSummary. Hope that helps. Totally second the comment re: FreeAgent has had this for years! I only discovered today that my moving to Xero will mean that I cannot have time by project, this is ridiculous! Thank you for bringing this feature so that you can now align with other similar SAAS. Great to hear Projects is going to be a good fit for you and your team. We’ll be making it more widely available during December. Keep an eye out within Xero, a new Projects tab will appear as soon as it’s available for you. When it says Coming in 2018, do you mean January 2018? Im trialling it out with a project and its necessary to have the expense claims linked straight to it, in fact all that you mention needs to be released asap (the user permissions, Project templates and timesheet insights). Glad you’ve tried out Projects. If you’re also trying out the New Expenses claims you can already link these to your projects via the web interface. We’re working hard on those other features so keep an eye out for product updates as we go through 2018. There will be new features in January 2018 but not everything described above. We’re a small consultancy but our billing is convoluted with a mix of fixed price and t&m projects that all have billable and non-billable time plus salaried and sub-contractor staffing. We use Harvest with a lot of manual guff throughout. I’ve now added Projects to my subscription, and its looking good, but very basic. Keen on knowing when user access will come in (2018 early/late?) so my consultants don’t get to see invoicing and charging details, and also when timesheets and payroll will be integrated so that leave can be booked for perms right alongside project timesheeting (at the moment its two places!) and so that casuals can be paid from project billable time. Finally, you have charge rate at the task level when its often at the resource level (ie, same task can have separate rates for different resources) – presume there will be no change on this, and it will mean setting up tasks for every combination of task x resource-rate permutation? Overall looks good but basic and might not take us away from Harvest just yet.. Projects user permissions is currently work in progress, so would be earlier in 2018 rather than later. Appreciate the double entry currently between Projects time and Payroll time, and it is something we intend to look at. Assigning a charge rate at resource (staff) level is something we are looking it doing, however no specific timeframes at this stage. Thanks for taking a look and passing on your feedback. Hi, when will quotes be integrated with projects please? No specific dates at this point in time but is definitely on our roadmap. I also just wondered about integration of time tracking with payroll as well. We currently use Harvest and it’s pretty good but I can see you guys developing a more integration solution at the same price point — easy choice to come over for me. I’ll keep an eye on this development. I think it’s a good software development choice and the price is already what we pay to HArvest. Thanks Mikey, lots more product development for Projects to come, including Payroll. Hi, I was looking at Xero for my general contracting business as an alternative to Quickbooks. Am I correct in understanding that Projects is still not available directly through the software for the customer? There are no local to me Xero accountants when I searched on your site, so does that mean I am excluded? I was seriously considering this software, but that is a feature I really need so it’s kind of a deal breaker. Projects is currently still only available in the US through Xero partners, in all other regions is available to add directly to your Xero Subscription. I’ll ping you directly and make sure you can get access. Cheers! I have a client using Harvest which we integrate with Xero very nicely with regards the Invoicing side of things. The client loves the timesheet process and data and the Budget and cost converstion to Invoice. Are there any differences other than price between Harvest and XERO Projects please? I can’t see any? Hi Vicky, I’ll get one of our team to catch up with you directly. Thanks! Hi, My client is looking to switch from Timepro to a new project management product. We are looking at Projects or Workflow Max at this stage. In projects, whilst time is still tracked separately to the payroll timesheets, are we able to view reports on an employee’s chargeable vs non-chargeable time from the project timesheet function? Also is Xero looking at a feature to be able to include all detail from the task level into the invoice? If so, what is the timing on this? At this point in time in Projects is still separate from Payroll, but we intend to have Projects time inform Payroll time. We are also working on visualisation of how time is spent by employees in a business for things like chargeable vs non-chargeable or total time entered over a given week say. Keep an eye out for that in the coming months. This will be supported by a more traditional report but I don’t have a specific timeframe on that. If by all the detail on the task, you’re referring to the descriptions entered on time entries, then this is a common request that we are investigating, but no more than that at this point in time. Currently a project’s tasks are set up to mirror what will flow through to the invoice for a task and expense invoice. Hope that helps. Are there any further updates with the chargeable vs non-chargeable reports? Also does Projects have a countdown timer like Harvest and WFM? When is the project templates function going to be released please? For monthly retainer based projects/services, not being able to duplicate/copy existing projects nor create a project from a template is going to make Managed Service (vs Professional Service) projects in Xero very painful. Is it possible to import a project list via CSV? No sorry, no import of projects at this stage. We are currently looking to come on board with xero. I see I can track costs of purchases and sales. However I also need to enter labour to projects as a cost that is not billable. Am I correct in thinking I can do this through the Expenses route, enter the charge but not charge? Hi, to echo the question of Vicky above re Harvest, I also use both Harvest and Xero – Harvest for project and time management. Harvest has a great user interface for easily entering time – both desktop and mobile app. Xero is quite clunky in comparison. I am trialling Xero on a couple of projects in order to understand whether to stay with Harvest for projects and time entry. 1. Do you acknowledge the usability issues in Xero time entry and do you intend to enhance (using the likes of Harvest as inspiration). 2. Will the Xero app be enhanced to allow time entry? Thanks for your feedback. Yes we are intending more investment to make time entry easier, both in the browser version and the Projects mobile app. The Projects mobile app allows for time entry, and general management of your projects in Xero on the go – it is however a separate app from the core Xero app. Check it out via the App Store and Play stores respectively, and let us know what you think. Hi – We started using Xero Projects for the one piece of work that our accounting business needs to charge by time – a Family Law matter. But the time entries can’t be automatically listed in a Xero Invoice. PLEASE – Fix this fast for us!!! Is it on the upcoming release list? Thanks! Will projects have the ability to control-change team member charge out rate at a per task level? If so can this be input at the quoting stage? This is a feature which WFM lacks and apparently cannot implement. What is the schedule for WFM end of service support and is it expected that Projects will take its place? Do you have a product development timeline for both WFM and Projects that you can share with everyone? Will there be a direct migration ability to go from WFM to projects? Frankly, it looks like Xero is rebuilding WFM which leads me to some uncertainty around our firm continuing to use WFM. Your clients needs to know exactly where Xero is headed with these products to plan for future migrations and effort or expense to put into these products. Hi Ben, WorkflowMax is still a big part of our job management strategy. Essentially we see them servicing different parts of the market. Project is not replacing WFM and is very much part of the Xero family. Projects is best suited to small businesses and solo operators within professional service industries with simple job management needs such as design agencies and IT professionals. As you know WorkflowMax is a full featured complete job management system. It has much richer customisation than Projects and is therefore better suited to those SMB’s running more complex businesses with large numbers of customers and staff. We’re not planning a migration tool between WFM and Projects at this point-in-time. If you’d like any help with WFM I can put you in touch with their newly formed Enablement team. Could you please advise when we would be able to start a project from a quote or even add quotes to a project. I have really enjoyed using Xero over the last (I’ve lost count) maybe 5 years, seeing projects suddenly become available it ticks all the boxes but without quotes, it’s useless to me – sorry. It’s not possible to link quotes to Projects at the moment, but this is something we are planning to work on soon. Thanks for your feedback! As a new user of Xero, can you confirm if it is possible to directly link costs within Purchase Orders to specific Projects at the point of raising the PO? All I can see is linking bills (or supplier invoices) once they arrive from the supplier and have been posted on Xero. As a SME construction company, we can be waiting days if not weeks for suppliers to make their invoices available to us, and we need a live project cost in order to manage our business day to day. Pulling PO costs into project immediately is the only way we can do this. I know the workarounds are not ideal, but hope this helps. HI I am a certified Xero Advisor. Can you please explain the logic of Projects requiring all staff with project timesheet entries to be registered “users” of Xero. I am thinking in particular of a trade services company with 14 field staff and one office staff (who is the xero “user” and who needs to input all timesheet entries each week). Why cannot this user simply enter the project times for the field staff with the same permissions as say wages? It appears that every field staff member must be a Xero “user” for their timesheets to be input in projects. Unfortunately this exceeds the price pain point for many – just think projects is a $10 per month cost initially for a single user – but this magnifies to an extra 14x$7 cost of $98 per month if all field staff are set up as users! That is $120 per year compared to a massive extra $1176 per year to handle the field staff. Obviously projects will quickly become unaffordable for many small businesses once their field staff exceed just a few. I would normally advise the client to simply input the project times into excel for all the field staff then add a series of job cost entries each week. Is there a better way OR does the Xero roadmap include any fix for this ridiculous limitation (or is it a more intentional revenue grab mechanism at the expense of small service co’s running field staff?). Projects is designed to be used by the end user, so that employees (or contractors) can enter time entries themselves, rather than rely on administrative staff to input the data. As for the pricing, we use an active user measure for Xero Projects which means you only pay for a user where they are active on a project within a given month. This flexibility offers better value to businesses of all sizes rather than a single fixed fee and is consistent with our other add-on features.